Mazda Certified Pre-Owned vehicles are all but new, thanks to the rigorous 160-point inspection that each vehicle undergoes before receiving certification. We here at Piazza Mazda of Reading go so far as to think the Mazda Certified Pre-Owned program is one of the best available to consumers, period. Here are two reasons to prove our case. The powertrain warranty covers service and repairs for all components of the powertrain, including drivetrain, engine and transmission. Since routine service is advisable to keep your Mazda Certified Pre-Owned vehicle running extra-smoothly, it's a good thing that the powertrain warranty entitles you to brand-targeted service and repair at authorized Mazda dealers. The zero deductible goes hand-in-hand with the powertrain warranty. 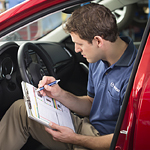 It means you have zero out-of-pocket costs for repairs and parts replacement. You may never need to replace parts, but it sure is nice knowing you won't have to pay if you do. This zero deductible applies to Mazda dealers throughout the United States.